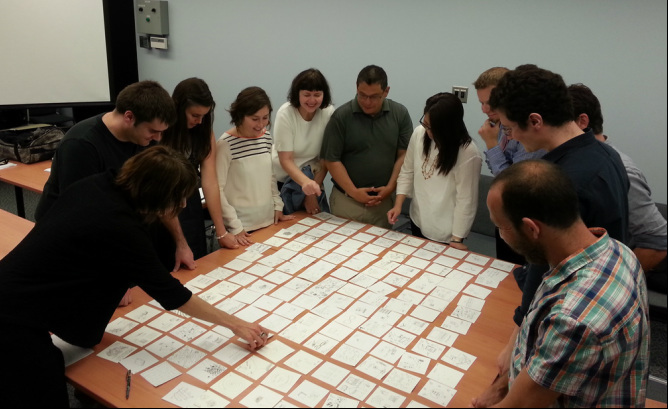 During fall semester of 2013, doctoral students at the Faculty of Information, University of Toronto, conducted collaborative iSquare research under the direction of the course instructor, Dr. Jenna Hartel. The project was a substantial component of the course INF3001: Information Research - Foundations; included in-class discussions and hands-on workshop sessions; used a convenience sample of masters students at the University of Toronto; required collaborative data-gathering and data-management; and gave the doctoral students the freedom to analyze the data set independently with an analytical strategy of their choice. Here is the group examining and discussing their data (156 iSquares) for the first time. The iSquares from this project are included as #138-293 of the corpus. Photograph by Zia Babar.